The Trump administration is moving ahead with plans for a second summit between President Trump and North Korean leader Kim Jong Un despite growing frustration among U.S. officials about the lack of progress on getting North Korea to denuclearize. Nearly six months after their first meeting in Singapore, the scramble towards another sit-down is a sign of how far apart the two sides are, with the U.S. demanding North Korea dismantle its nuclear weapons program entirely and take steps to do so before it wins sanctions relief and North Korea continuing to develop those weapons systems, something it never explicitly promised to halt. It's precisely because things are stalemated that Trump wants to sit down with Kim again, National Security Advisor John Bolton said this week, but that has undermined his administration's ability to negotiate with the North Koreans and get them to move towards denuclearization, according to several analysts. "It totally cuts Secretary of State Pompeo and the Special Representative Steve Biegun at the knees," said Jung Pak, a senior fellow at the Brookings Institution. "What is the incentive for North Korea to actually talk about the meat and potatoes of denuclearization with the Special Representative and the Secretary of State if the National Security Advisor has said, 'Nothing's happening, so we have to go straight to the top'?" Pompeo was supposed to meet with his counterpart, North Korea's chief nuclear negotiator and former spy chief Kim Yong Chol, in New York in November before North Korea canceled the trip at the last minute. His Special Representative for North Korea Steve Biegun, who was tasked with leading working-level talks with North Korea, has yet to meet with North Koreans for his own meetings over three months after his appointment. "They've clearly avoided having these working-level talks, which is where agreements are generally hammered out in advance of a summit," said Adam Mount, a senior fellow at the Federation of American Scientists. "The North Koreans calculated that they can come up with better deal from talking to the president directly." Pompeo's meeting with Kim Yong Chol still has not been rescheduled, sources tell ABC News. But CIA Korea Mission Chief Andy Kim - who has been Pompeo's right-hand man on this issue since Pompeo was CIA Director - was reportedly at the Demilitarized Zone on Monday to meet with North Korean counterparts, according to South Korean media. It's unclear who attended for North Korea or what the aim was, but the two sides are still trying to settle on a date and location for a second summit. Bolton said Thursday the administration expects it to take place in January or February. 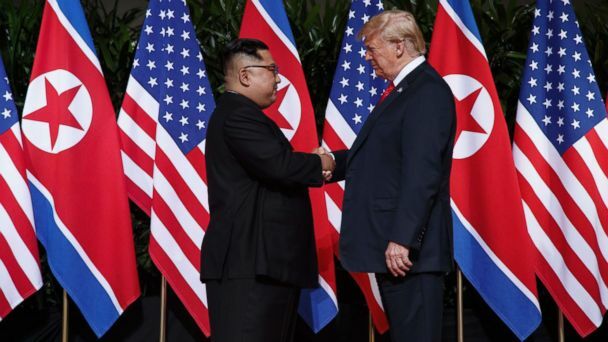 "All this summitry and diplomacy will continue because it works for North Korea," said Sue Mi Terry, a senior fellow at the Center for Strategic and International Studies. "They're making progress without having to do anything on the denuclearization front... They're on their way of getting eventual international acceptance, North Korea, as a nuclear power, a responsible nuclear power." While the U.S. has touted the talks and a lack of missile or nuclear tests as progress, North Korea has taken no steps to dismantle their existing nuclear weapons stockpiles - something analyst point out they never promised to do. Instead, they have destroyed a missile engine test site and a nuclear test site, although they have not admitted international inspectors to verify that. Pompeo said after a trip to Pyongyang in early October that would happen "as soon as we get it logistically worked out," but two months later, there's been no public progress. In the months since the Singapore summit, North Korea has also expanded a key long-range missile base known to the U.S. and worked on construction at a nearby newly discovered missile facility, according to a new analysis of satellite images by the Middlebury Institute at Monterrey's James Martin Center for Nonproliferation Studies. It's evidence that the regime continues to "mass-produce and deploy existing types of nuclear-armed missiles," according to the report's authors, Jeffrey Lewis and Dave Schmerler. But it's not technically a violation of the declaration Trump and Kim signed at the Singapore summit because North Korea "never said it would" disarm, as Vipin Narang, an associate professor of political science at the Massachusetts Institute of Technology, tweeted Wednesday. Instead, they committed to the more vague term "denuclearization," just six months after Kim vowed to expand mass produce nuclear weapons in a New Year's Day speech -- a promise he is clearly keeping. "If North Korea had made the decision to disarm, they would be behaving differently. They're perfectly capable of participating in working-level and presidential talks and demonstrating consistent, substantive progress," said Mount. "They are not doing that, which I think should tell the White House something about their intentions."